Horizons has been manufacturing high quality, custom window shades for more than 100 years. The Horizons tradition of expert craftsmanship continues with Made In The USA Fabric Roman Shades that are as functional as they are attractive and affordable. 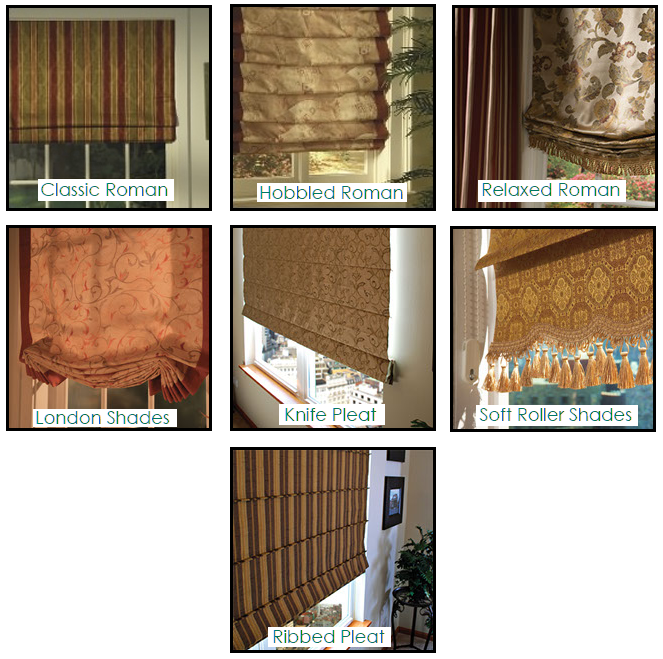 Horizons offers literally thousands of Roman Shade fabrics, materials, patterns, colors and styles to choose from. And we bring them to your home – so you can select your window treatments in the rooms where they will hang. This ensures that – no matter what your individual design style – you will find the perfect blinds and shades for your decor and your budget. While Horizons’ workmanship, attractive designs and sturdy construction are on par with high-end brands such as Skandia™ & Hunter Douglas™, you will find that their price points are considerably more competitive than the larger brands. This means huge savings for you, while still getting the highest quality, custom blinds and window shades that you desire. The Classic Roman Shade is both simple yet elegant – and can be manufactured in fabrics from traditional to modern. The Classic Roman Shade gently folds when raised, and lies flat when completely lowered. The Hobbled Roman Shade is a new take on a favorite classic. Its fabric folds resemble the classic Roman Shade – but the cascading folds are maintained even when it is fully lowered. This decorative take on a Roman shade “gathers” on either side when – resulting in the shade lying flat with a gentle bottom curve when lowered. Horizons’ striking Knife Pleat Shade have doweled pockets on the back of the shade to form tailored seams on the front. These window shades lie flat when lowered – but maintain their crisp pleats whether raised or lowered. The London Shade lies flat with bottom folds constructed approximately 10″ in from each side. Truly European in design, this popular fabric roman shade adds ambience to any room. The Ribbed Pleat Roman Shade features a striking “reverse” knife pleat – created by dowels in the front of the shade. The dowels add architectural interest, maintaining the sharp ribbed pleats whether the shade is up or down. The Horizons Soft Roller Shade offers the best of both worlds, combining beautiful drapery fabrics fused to quality blackout shade cloth… all functioning on a smooth running spring roller shade or optional Clutch. Choose from a virtually unlimited selection of soft & elegant fabrics, colors, patterns and designs.